I visited the shop half in joke, but I tried one on and found it very comfortable to wear! I wasn’t aware when I first saw them that they were jersey kimonos until someone told me they were made of knitted wool and cotton. Although it is extremely elastic and looks like casual wear, it can be “dressed up” by accessorizing with a fukuro-obi (a formal obi). I thought the combination looked good in photos. This JERSEY has one seam but other have two seams which is a trademark of regular jersey wear. Even someone new to wearing Kimonos can enjoy wearing it with a variety of colorful obi because of its plain texture. 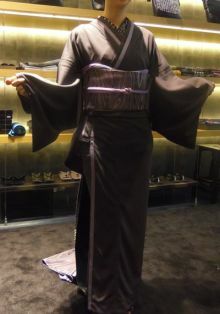 By the way, a jersey Kimonos could pass as formal wear. It could, for example, be acceptable to wear one in a hotel where the dress code bans casual clothing.(laugh!) It was proved that shape is more important than material. Next let me introduce you to a denim Kimono by Kururi. When we think of denim, we imagine jeans, but actually this denim material is very thin! It looks like an unlined Tsumugi (pongee) Kimono. I don’t have any photo now, so please check their official website above.